The jet stream has invaded the deep south of the United States bringing unseasonable cold to the area. 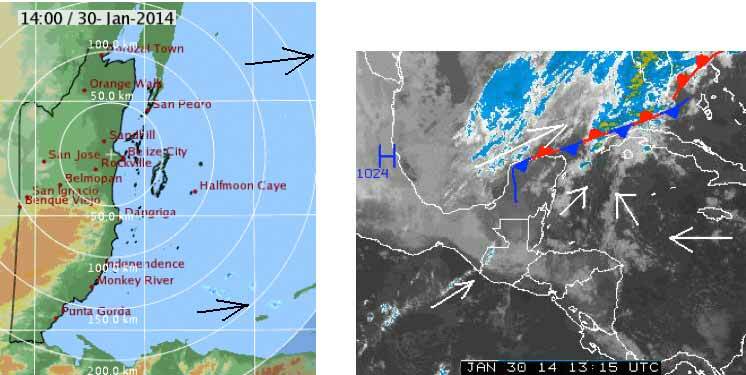 The cold front is suppose to stall just to the north of Belize so we will probably miss the frigid temperatures. Right now a slow moving trough of lower pressure is moving across Belize causing an outbreak of rain. Belize NMS: Mainly fair weather expected the next 24 to 48 hours as a stationary front dissipates near the Yucatan Peninsula. 24-hour forecast: Sunny with a few cloudy spells today. Mostly cloudy skies tonight and tomorrow with a few showers or periods of rain will be isolated and occurring mainly over northern and inland areas of the country. Winds: West - northwest 5-15 knots. Today: Winds: W-NW 5-15 kts. ; seas: Light chop - choppy. ; waves: 2-4 ft.; isolated showers mostly north. 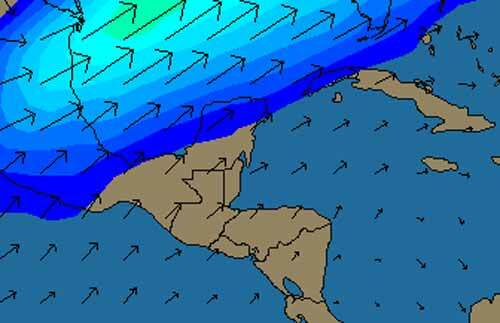 Tomorrow: Winds: N-NW 5-15 kts. ; seas: Light chop - choppy. ; waves: 2-4 ft.; isolated showers. Marine Outlook: Friday night:- winds: NE'ly 5-15 kts. ; seas: Choppy. ; waves: 3-5 ft.; isolated showers mostly south. General Outlook: From Fri. and Fri. night is for mainly fair weather with cool conditions and showers generally isolated. On Ambergris Caye this morning we have a breeze from the back of the island and heavy overcast. Our expected high is 80 f. The wind is NW at 9 mph. Strong Westerly wind much of the night. . .What rain there was over the sea, now pushed further away and fading out. That cool front is dissipating, I show it in light blue line to the East of Belize, having caused some heavy rain over much of Belize yesterday afternoon. Looks like the Westerly winds will prevail much of the day, little or no rain.. . . .I think the sun will break through today, as it warms up.